Day 1: Downtown Asheville and the Trolley Tour (take the Red Trolley), wonderful orientation to Asheville and the Asheville Area history and culture. Start at our wonderful Visitors Center (with Free Parking). Hop on and hop off privileges on the trolley are good for 2 days at all stops. Get off at the Grove Park Inn, walk through this historic hotel, go next door to the Grovewood Galleries for lunch at the cafe, and visit the car museum at the Grovewood Galleries, as well as the wind garden and various local artist galleries - view local glassblower at work. Another stop - get off at Thomas Wolfe Museum and boyhood home - ticket is included in the Trolley Tour ticket. Watch the short video, tour the home. Walk through parts of downtown Asheville, Pack Square and beyond. Stop at French Broad Chocolate Lounge for a very sweet pick-me-up locally made (bean to table) chocolate. Find your last Trolley stop back to the Visitors Center. Have dinner downtown and maybe a show at the Diana Wortham Theater, Altamont Theater, Asheville Community Theatre or the US Cellular Center, or perhaps a walking ghost tour. Day 2: Biltmore Village and the Biltmore Estate. Get discounted 2 day tickets from us. 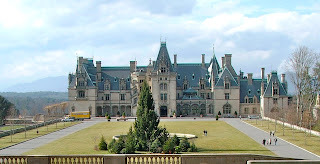 The Biltmore Estate has a lot to take in and a 2 day pass is worth it, even if you just spend an hour or two there the next day. Our 2 day pass is usually less expensive than the 1 day pass at the Estate Ticket Center. Tour the house, take in the Conservatory rose gardens, bass pond trails and grounds; there are over 8,000 acres that make up the estate grounds and there are walking trails and biking trails around and about the property; take a picnic lunch, lawn chairs and a blanket for your own wine and cheese at the Lagoon area (go ahead - have a traditional southern style "tailgate lunch" at the Lagoon area - some of the best views from there of the Biltmore Estate); take in Antler Hill Village and demonstrations at the working farm, enjoy wine tasting at the adjoining winery (wine tasting included in your ticket). Have lunch at the Bistro, right next to the winery, or one of the other many restaurants found on property and with a great little shopping area for gifts and wine to take home. On your way out, try dinner in Biltmore Village on this evening, our top two picks are Rezaz or The Corner Kitchen - reservations recommended. Day 3 Blue Ridge Parkway - Brevard, NC 80 mile driving loop: Start at mile post marker (MPM) 384 at the Blue Ridge Parkway Parkway Visitor Destination Center, open year round, 9am - 5pm excepting Christmas Day, Thanksgiving Day and New Years Day. This is a great place for an introduction to the history and beauty of the Parkway, with a 24 minute award winning film. Route: From the Folk Art Center (MPM 384) or the Blue Ridge Parkway Visitors Center (MPM 382) drive south along the Parkway for about 30 miles. Exit the Parkway at Hwy 276 towards Brevard, NC for about 18 miles, then Hwy 280 east for 16 miles, towards the Asheville/Hendersonville Regional Airport where you can pick up I-26 west back to Asheville, NC. This is an 80 mile driving day, but well worth it and so many great stops from which to take in the mountains of Western NC with a variety of options to meet your personal style. There are mile post markers every mile along the Blue Ridge Parkway. Some of our favorite things to do along this particular 30 mile stretch (with 11 tunnels) are a visit to the Folk Art Center, Visitors Center, a stroll in gardens and trails within the North Carolina Arboretum, entrance just off MPM 393, a hike, stop at the Mount Pisgah parking lot and head uphill to summit Mt Pisgah for amazing long range views from atop this 6,800 plus foot mountain. If the timing is right stop at MPM 408.5 at Pisgah Inn for lunch - try the fresh trout. Perched on the edge of the mountain at 5000', Pisgah Inn hosts impressive long range views out of the large glass windows of the dining room. Pisgah Inn is one of the few buildings you will see along the entire length of the Blue Ridge Parkway's 400 plus miles. Get off the Parkway at MPM 412, taking Hwy 276/Wagon Gap Road east towards Brevard, NC. Pink Beds is a wonderful picnic spot with picnic tables, public restrooms and open meadows. Additional favorite stops along Hwy 276 include Sliding Rock (fee area for parking) for an exciting slide and breath-taking dip - or watch others as they take the plunge! A favorite easy and relatively short (2 miles) forest hike along this stretch of Hwy 276 is the Moore Cove Falls hike, located about a mile north of Looking Glass Falls. The Parking lot for this trailhead is on the east side of 276 (left as you are descending) with parking by a bridge. Next on your left will be spectacular Looking Glass Falls, a picture perfect water fall right off the road. Park and take the stairs down to the foot of the falls for better views of it and even a try dip in the pool at the base of the falls, if you're up for it! Continuing on 276 will take you into the quaint town of Brevard, NC for a nice dinner, or head on back to Asheville. Arts & Crafts, Food & Beer: In the morning, take in the Downtown area of the River Arts District (RAD) in the revitalizing warehouse district along the French Broad River. Watch artists at work - from glass blowing to painting to welding and more. Shop for items right out of the studios. Have a light lunch at 12 Bones (best ribs in town) or White Duck Taco Shop and maybe a beer at the Wedge Brewery and tasting room. But eat and drink lightly because we recommend either the Walking Food Tour or the Downtown Brewery Tour offered by Eating Asheville, for your afternoon adventures. The Food tour is a downtown walking tour giving you a taste of some of the "finest and most delicious sights and tastes that the city has to offer," visiting 5-7 restaurants, from 2 to 5pm. Or if you're more in the mood for taking in the Asheville Beer culture, try the Downtown Brewery Tour and find out why Asheville has been voted Beer City USA for 4 years in a row, and of course sampling some of Asheville's finest in craft beers. Stephen and Josh are the knowledgeable and fabulous guides for your Eating Asheville Food or Brewery Tour. That's four full days - and any of these one day options could become two days, so take it in and enjoy. Less is more when it comes to enjoying a day in Asheville! And if you're looking for a place to stay, Oakland Cottage Bed and Breakfast is centrally located, just 1 mile from the Biltmore Estate, 1/2 mile to the River Arts District, 2 miles from the entrance to the Blue Ridge Parkway, 2 miles from Asheville's Historic Downtown Center. Or for larger groups or families, try an Asheville area Vacation Rental, call the reservation offices at Vacation In Asheville, 9am - 5pm daily, or book directly online.